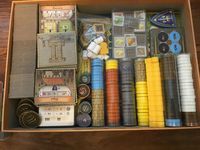 Last year, my 2017 New Year’s resolution was to take control of my overflowing board game shelves. I purged. I reorganized. And finally, I compressed. i.e. I squeezed every expansion into the core box. That turned out to be most effective, least painful space saver. And then all that was left was Orleans. The best for last. My top game since it came out. Surprisingly, even though the Deluxe Version had a limited print run, there are a lot of inserts available for sale. While they were all very nice, they could barely contain the base game, let alone all the expansions. There was the Invasion expansion. And then Trade & Intrigue. 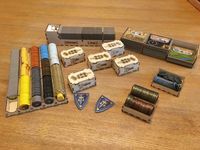 And then all those tiles from Neue Ortskarten. Yes, even Prairie. It was a lot of parts. And before I started this journey to get everything into one box, I needed a lot of plastic to keep it organized in 3 cardboard boxes. My first step was to figure out what I was dealing with. 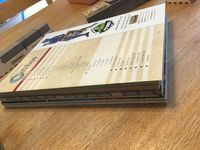 This is a stack of all the big boards from the base game and 2 big expansions. This was unchangeable. It would fill the entire box and leave a little less than 2 inches of space to work with. My next step was to see if it was even possible for everything to fit. And yes, it was possible. However, when I tried with baggies, all the pieces were clumped up and the box could not close. All the parts would only fit if everything was meticulously organized. So I sketched something up. And I did untold measurements and remeasurements. And then I thought it might be possible. I could try to put together a wooden insert. But I had never designed anything for laser cutting. Weeks later, I thought I had a design that I thought could work. Things were tight. Down to a tenth of a millimeter of wiggle room. I even added engravings, so it would be easier to figure out where everything went. Here’s the first cut. Hot off the laser. The first set of boxes, I made a rookie mistake. 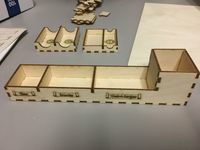 My calculations were off by .5 millimeters and I needed to sand down the interiors to get the pieces to fit. 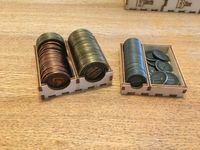 I also needed to make adjustments, because I added an extra set of metal coins to make up for all the cardboard coins in the expansions. That’s 2 sets of coins there. The player boxes were the trickiest part to figure out. There was so little space and so many pieces. I also wanted to show all the available pieces with engravings. Finally, the core of the insert. All the main pieces. It’s important to note that I only sticker one side of the Character Discs. When a Character Disc stays put for a round, we flip them over to the blank side to indicate that they’re “locked” in place. If they were stickered on both sides, there’s no way they would fit. To aid with setup, everything is engraved, so you know how many pieces come out depending on player count. Each character was hand-traced for the engraving. This was a beast to do. And the ultimate test. Everything fits perfectly. Right up to the top of the box. Here's what everything looks like without the box. Those player bags were the bane of my existence. I don’t know how many times I thought I had everything figured out but then realized that I forgot about the bags. Here’s the whole setup. 10 boxes in all. It should be noted that this does not include the Wooden Resource Tokens. I got rid of them when I first purchased the game, because they dragged out setup and hindered game play. There’s still space for Neue Ortskarten No. 5 and the Promo Ortskarten N°1. But not sure about Opera and Drawbridge. The box might explode if they’re added. That is amazing work. 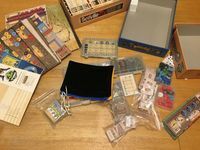 I have been in the same board and was just going to use the main deluxe box with the first expansion's box for storage. 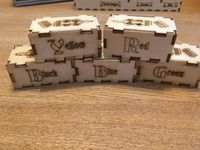 Any plans on releasing the files for those that have access to a laser cutter or selling some like Broken Token? Or maybe you could sell the design to Broken Token. This is absolutely incredible! Well done and I'm supremely jealous! Any chance of sharing the files so we can attempt to replicate your fine work? +1 !!! Take my money!! Great work. Also interested in the files (or purchasing one). 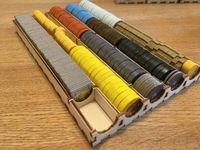 I still have my wooden good tokens, but I like how you managed to get everything else to fit! I also would be interested in a copy of this! Really nice work! I am having the same storage problems but I have the Dlp version with the "meeples" instead of discs. 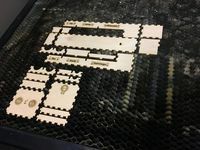 what program did you design in and what laser cutter do you use? The templates were drawn in Adobe Illustrator. I went overboard and used an industry-grade laser from Coherent Technology. 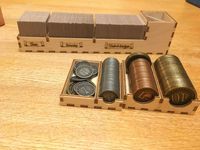 3) I dumped my wooden Resources token, so the insert only fits the cardboard chits. 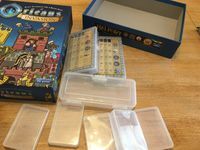 If there's enough interest, I could try to find another copy of Orleans Deluxe to adjust the template to be more universal. But it would require quite a bit of interest. WACKY WAVING INFLATABLE ARM FLAILING TUBE MAN!!! I made my own laser file to fit the dlp box and the fan kit components if anyone is interested. I won't have access to a lasercuter until university starts in the fall thoguh so can't test print it. It's made for any 3mm thick material. Could upload it if someone want's to give it a shot. Do you have the expansions as well? I wouldn't mind looking at it!